Beginning in 2019, after holding our prices constant for 6 years, we are finally forced to adjust our prices across the board to reflect the ever-increasing costs of doing business in this inflationary world. We regret this necessity and therefore kept the old prices throughout the past holiday shopping season. 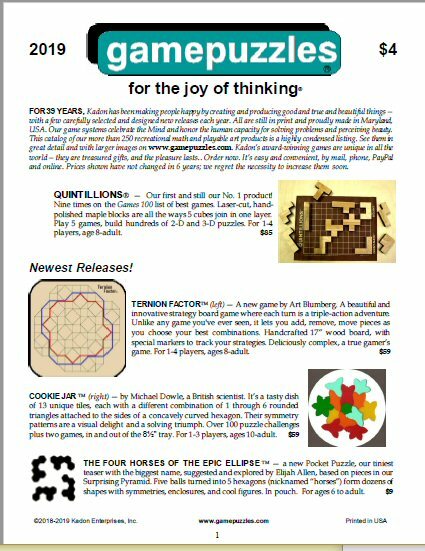 Order your gamepuzzles now, before the prices go up. For the Joint Mathematics Meetings in Baltimore in January 2019, our exhibit of "mathematical recreations" entertained a few thousand visitors, and Kate contributed some limericks to the math poetry session. See also the Arc Angles poster chosen for display in the JMM art exhibit. Our three months of art shows in the Sunshine State (notwithstanding its sudden downpours) kept Kate and energetic helpers, Elijah Allen and Krystal Goodrich, driving to venues from Miami to Sarasota, and north even to St. Augustine. Not a single snowflake in sight while our northern friends had a rough winter. See our show calendar for where we'll be next. Video of one Super Quintillions solution now online! Watch a piece-by-piece assembly of how the 18 superquints build into a tower that will then slide into its box, starring Krystal Goodrich's talented hands. Filming by Elijah Allen. Our Tricolor Stomachion is in a YouTube video! 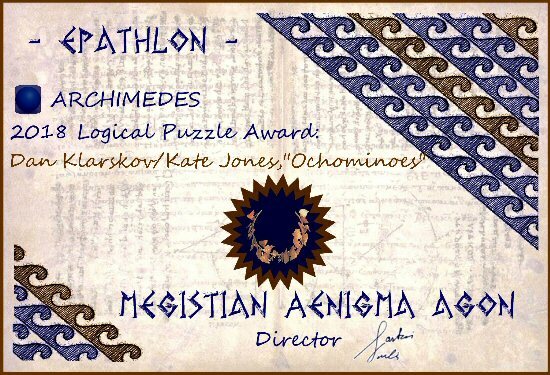 Joe Marasco has created a fascinating video documentary about our Archimedes' Square puzzle, also known as the Stomachion. You can watch the amazing story of the origins and development of this 2200-year-old treasure and its many solutions as Joe explains its inner secrets. See the Tricolor Stomachion. The long-awaited Hexnut rulebook has arrived! "Under construction", it said for years, and our very patient fans bought this complex classic Hexnut set, knowing someday the book would also be ready. If you are one of these good souls, let us know your current address and we'll mail you the printed book. You can also access the digital file of it right here. The 8th Annual Festival of Mind and Doris Championships, organized by Zdravko Zivkovic, took place in many high schools in several European countries, building creativity and featuring our Doris puzzle. See the report of the winning designs, semi-finalists, and Grand Finale ceremonies. "Desert Island" (right) by Matej Fijacko won first place. Caranza is the stage name of Patric Hale, a phenomenal Meistersinger who has achieved both tenor and baritone mastery of 12 genres of music in 7 languages, with moving emotional sensitivity and blow-you-away power of delivery. He has a repertoire of hundreds of recorded songs, available on 22 CDs, ranging from Elvis, Sinatra, Tom Jones and Billy Joel to Broadway tunes, German songs, Italian and German opera, and more. Here are links to four audios to give you a start. Then visit our showcase of the entire collection and order his CDs to enrich every day of your life. 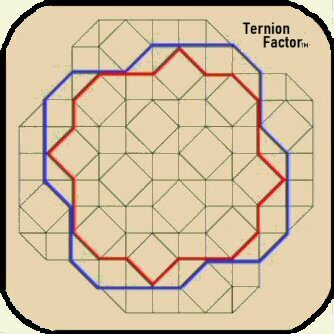 Ternion FactorTM  Our newest strategy game! The Four Horses of the Epic EllipseTM  a wild ride! Deluxe wood Poly-5TM  available again! 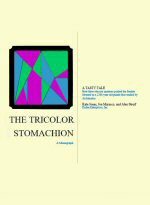 Tricolor Stomachion Monograph  the latest word! We're celebrating these games on the 25th anniversary of our first publishing them. They have been continuously in print, 1994-2019. In 1993 we had introduced a deluge of 9 lavish creations. We followed the next year with 12 more, mostly large pieces again. See their stories in our historical notes, Angles, Gold and Gala. We got intrigued and enchanted by the mathematics of the golden ratio, phi, and the lure of Penrose tiles, and finally pulled together several large kits and art pieces based on phi. CollidescapeTM  the two golden triangles in pods of 8 tiles, each in 5 colors. Starter set, 25 pods; expansion set, 55 pods. Enough to explore grand designs. Penrose Diamonds  two shapes of rhombs, 36 and 72 degrees, build five-fold symmetries non-periodically. Pods of 8 tiles, in 5 colors. Starter set, 20 pods; development set, 50 pods. Enough to study this amazing phenomenon expansively. Math departments, you need these. 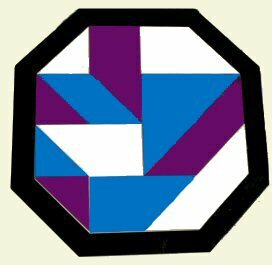 Penrose Kites & Darts  two shapes of tiles made of pairs of golden triangles, with non-periodic propensity. Pods of 8 tiles, in 5 colors. Starter set, 20 pods; award-winning master set, 40 pods plus game mat for up to 5 players. Deka-StarTM  a decagon of 40 Penrose diamonds, the two shapes in 4 colors. Form a galaxy of exquisite designs. This year in a silver frame. Rhom-AnticsTM  a glorious embodiment of thick and thin Penrose diamonds with edge colors, 45 of each size, in 23" frame. Your choice of 3-color mix. Rainbow Rombix®  36 unique rhombic tiles fill the 24-sided tray with 6 vivid colors. Royal Game of the Goose/Labyrinth (tapestry)  canvas version of our deluxe wood Renaissance game, backed by the 3500-year-old Labyrinth game. 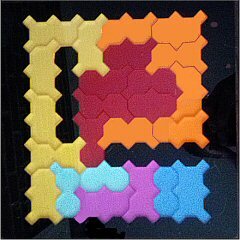 Dual Quintachex®  24 checkerboarded, wavy pentominoes, one of our most sophisticated sets. AmazonsTM  a much-analyzed strategy game for 2 players. Does it favor first or second player? Our Tricolor Stomachion now on YouTube! Kadon has its own Facebook page for wider contact with our friends and fans. It's warm and fuzzy to see how many "likes" are coming our way. Have you "liked" us yet? Please do. And we're able to share things there that don't have a place in our formal website. Check in now and then to see what other folks say. Our thanks to Elijah Allen for launching the page and helping to administer it. So come and talk to us there! The permanent link is on the homepage (look for the blue button). Any questions about our puzzles, praise and kudos are happily received. Join the conversation and look for special features from time to time. There will be no selling, only telling, in our Facebook lounge. For ordering please come to this main gamepuzzles site, where you'll find everything we make and an easy-to-use, secure shopping cart. We have an applet to play Proteus! A Proteus fan, Paul Nord, put his genius to work creating an app for your mobile devices so you can play our Proteus meta-game against a fairly smart computer. Get it now at the Apple store for under a dollar: Michael Waitsman's Proteus  then enjoy this superb strategy game even when you don't have a worthy human opponent available. Paul's program looks beautiful and works great. Kate has written a unique time travel tale that you can read online here: "When are you? ", providing a fictional background to some of our historical games. All the people are real; only the circumstances of their appearance are imaginary and coincidental! Now you can view our condensed 24-page print catalog with flippable pages or even as a slide show. The Flash program lets you zoom in, turn pages, and even click on any picture for a shortcut to its website display. Get an instant overview. Just click on the little cover page thumbnail at right. Works best with Chrome, Safari, Edge, or Firefox. To print out selected pages or your own full copy, go to our print catalog file (.pdf). For special categories and cross-references, see the Search Us index. If you've missed previous announcements or mailings, you can still track back to see what's been happening with us by browsing through our archives, especially the annual newsletters that sum up our year's doings. Here's the Archives index. Check out unsolved tough challenges on the Contests page. Open to the world, with prizes to be won. Happy puzzling! We own four very cool domain aliases. Each is just a title page ("splash page") and links to the respective major sections of the official gamepuzzles website. Take a look; they're jazzy. www.tactilegraphics.us is an entrance to the Tactile Graphics section and to Tilings and Designs. 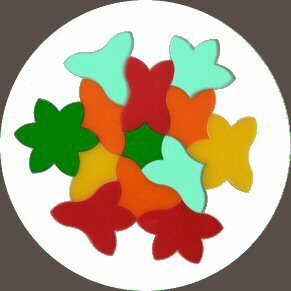 www.playable-art.com is an entrance to Tilings and Designs, Abstract Strategy Games and Edgematching. 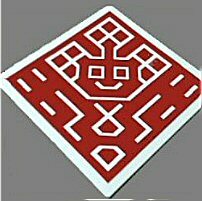 www.polyformpuzzles.com is an entrance to the Essential Polyforms section and Polyominoes and Polycubes. www.thelifeofgames.com leads to our journal, The Life of Games. Our Hexdominoes set is also a registered trademark and has its own independent website and domain name, with additional materials not found in our main website, such as the entire rule book and actual-size grids to print out for use with special figures. We plan to offer new challenges there eventually and maybe even some play-online features. A little logo for it is on the bottom of the homepage. And check out the awesome new designs we've found for this amazing set. If you would like to receive copies of our very rarely issued bulletins or newsletters, please send us your email address and we'll add you to our confidential mailing list. We never give out our list; your privacy is safe with us. You can also subscribe and advise us of any address changes through the Contact Us page. Blooper Bounty  This is a standing offer: we'll send a small prize to the first person who advises us of a mistake in this website, whether a typo, broken link or other goof. Each blooper gets a separate prize. Email us and provide your ground address, so we can mail you your prize. And thanks! Our hot-link icons are listed, along with some surprises and hidden prizes, for those of you who care to read directions for getting around this place. For the others, there's always logic, intuition and serendipity. This update page is overhauled monthly and updated momentarily.